Sonnet Designs: Thanks A Bunch! I wanted to try a clean and simple card and I have been dying to try out my first set of washi tape. I embossed a rectangle around the edge of the card front and then added strips of washi tape. I got this tape at Scrapbookers Anonymous--pop on by and say hi to Marilyn for me. I stamped this gorgeous image on X-Press It paper using momento ink and colored with copics. 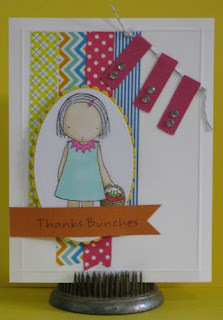 I used my spellbinders dies to frame the image and used the Mix and Match Banner dies from My Favorite Things. Have you ever tried their die-namics? They are great, so try them out for yourself. That's it for me this weekend. I'm off to Mom's to help set up her living room after some unexpected renovations. I'm looking forward to seeing how the reno's turned out. Happy Long Weekend! Love the washi and twine! Thanks for playing along this week at CAS-ual Fridays! So sweet. Love the MFT image! Thanks so much for playing with us at CAS-ual Fridays!